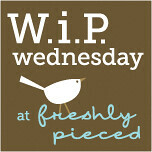 It's work in progress Wed. And I don't have photos of most of my progress. It's been a wild few days and today I was at one doc appointment after another. The good news is that I have been sewing my little heart out and am getting stuff done!!! The bad news is I haven't photographed it. I will be working on quilt sandwiches and quilting next week finishing the flimsies that I've stitched up! I am also clocking through the sewing room trying to work on the UFO's from years past. That's always a mixed bag. 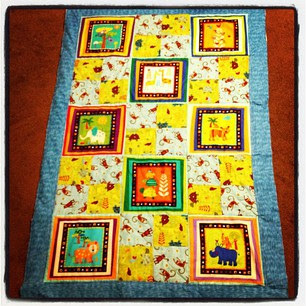 I wasn't a very good quilter when I started and some of those UFO's are a MESS!!!! Photo by instagram. Colors are a bit.....skewed. The yellow is actually green! This is an older UFO that I pulled out and finished for a baby shower (that I missed!) but I am sending it off to the mama who is doing a jungle theme (yay for UFO's!) so I was ahead of the game, until I realized that I missed the shower. Oops. I have also been making self binding receiving blankets and bigger ones for the punk. 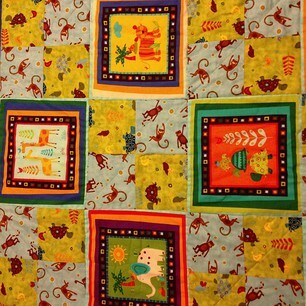 Love the animal prints - cute baby quilt. Hope things are going well.